Ford is toiling away, installing heavy-duty engine components into select 3.7-liter V6s to allow them to run on compressed natural gas (CNG) and liquid petroleum gas (LPG) in addition to gasoline. That’s nothing new, but now, Ford has announced that it will offer the 2014 F-150 with this engine configuration, bringing the Blue Oval’s total number of CNG/LPG-friendly vehicles up to eight. The F-150 will be the only half-ton pickup on the market that can run on these gases. Ford will charge $315 per vehicle to equip the optional engine, but the trucks won’t be ready to run on the alternative fuels straight from the factory and must be upfitted with additional equipment. A Ford Qualified Vehicle Modifier will install a separate fuel system for the compressed gases at a cost of $7,500 to $9,500, depending on fuel tank size. With the right-size tank, the F-150 equipped with the CNG/LPG-prepped engine can go 750 miles on one tank of gas, according to Ford, averaging 23 miles per gallon. The practice of offering flex-fuel vehicles is gaining momentum as businesses take advantage of cheap gas. CNG can be bought for $2.11/gallon on average (per gasoline equivalent), and sometimes for as little as $1.00 in some parts of the US, Ford states. “With the money saved using CNG, customers could start to see payback on their investment in as little as 24 to 36 months,” says Jon Coleman, Ford’s fleet sustainability and technology manager. The automaker expects to sell a total of 15,000 CNG/LPG-prepped vehicles in the 2014 model year. Check out the press release below to read the details, and to see what other vehicles Ford offers with the CNG/LPG package. 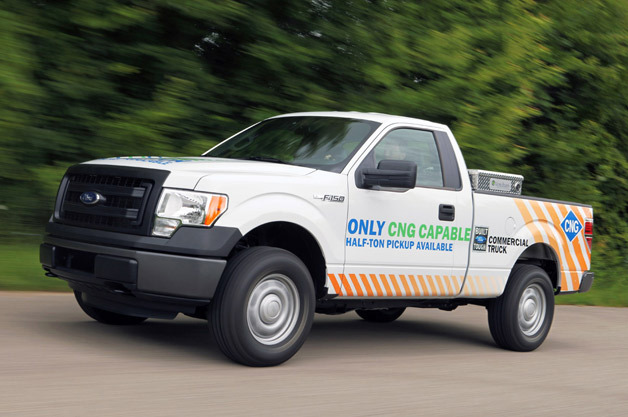 2014 Ford F-150 gets CNG option originally appeared on Autoblog on Wed, 31 Jul 2013 00:01:00 EST. Please see our terms for use of feeds.